Sue Franklin took the position of Court Administrator in Lauderdale County on February 24, 1986. Her tenure ends today with her retirement at the close of business, after more than thirty years’ service in the position. Attorneys, paralegals, secretaries, office staff, and judges who dealt with her will, I am confident, attest to how helpful, cheerful, and accommodating she has been. One of her salient qualities is that Sue never takes anything too seriously, unless it comes to protecting the time and security of her judges, and then she goes into full-court-press mode. Sue has been: paper-work-shuffler, quasi-secretary, advisor to confused lawyers and staff, scheduler, commiserator, receptionist, liaison to AOC, and a myriad of other roles that have freed up the chancellors to devote their attention to substantive matters. Anyone who has ever had any dealings with Sue would agree that the cake is spot-on. Court administrators did not become state employees until July, 1994, when AOC went into business. Sue and others in similar capacities around Mississippi at the creation helped design the position from scratch. Sue is certainly one of the longest-serving in the job, if not the dean of Mississippi court administrators. We will miss Sue’s wicked sense of humor, her willingness to roll with the punches, her devotion to her judges and lawyers, and her high spirits. 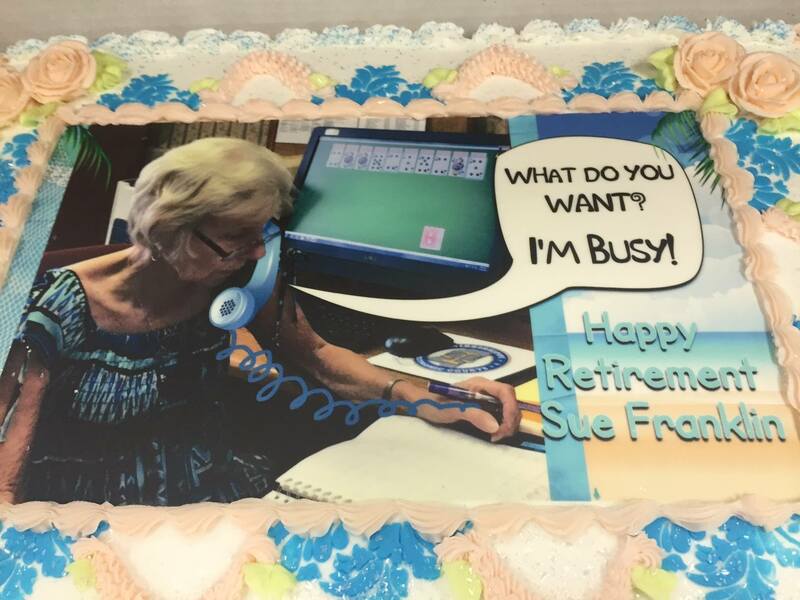 Best wishes in your retirement, Sue. May you live long and enjoy your freedom to spend time with your children and grandchildren. I will miss Sue greatly. She has been dedicated to every person she came in contact with. Happy Retirement!!! Sue has been a jewel. She was always a help to me when I was a deputy sheriff, taking my calls from the road without hesitation. And she was a life-saver many times to my practice of the law. Those are some big shoes to fill! Wish her good luck for me! This is a great tribute to Sue. She was always welcoming, accommodating and a professional. She is truly one of a kind! She will be missed, but has more than earned her well-deserved retirement. You are currently reading So Long to Sue at The Better Chancery Practice Blog.